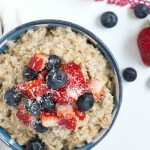 Creamy Coconut Oatmeal with fresh berries from Heather Christo’s new cookbook Pure Delicious! 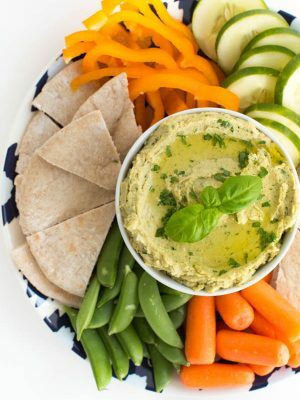 Her new book features more than 150 Delectable Allergen-Free Recipes made without gluten, dairy, eggs, soy, peanuts, tree nuts, shellfish or cane sugar. 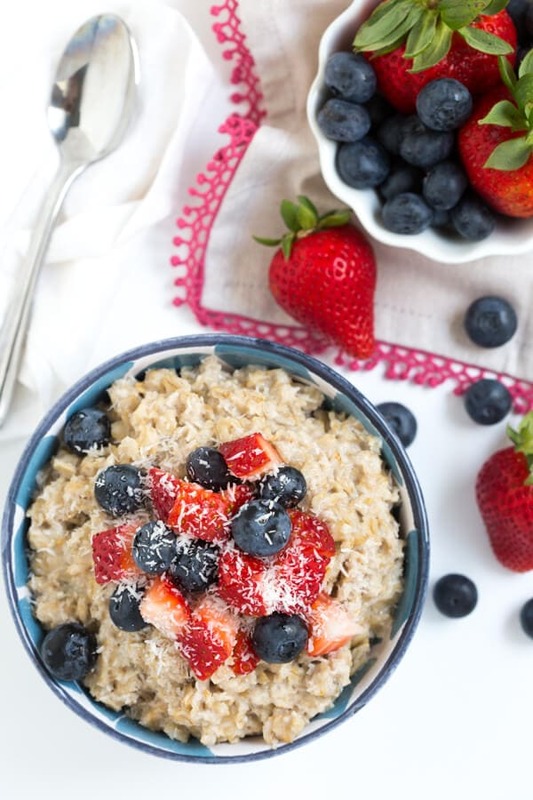 Start your day with a big bowl of oatmeal and fresh berries! 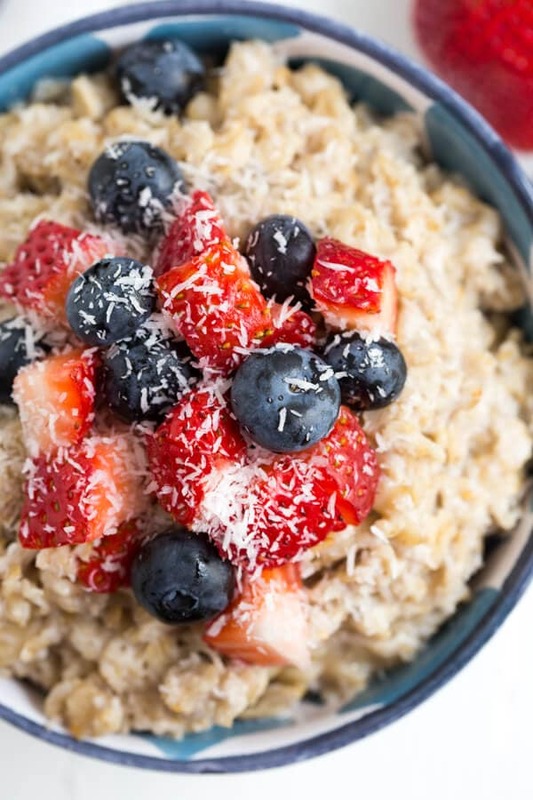 Let’s start the week off with a hearty bowl of creamy coconut oatmeal with fresh berries. 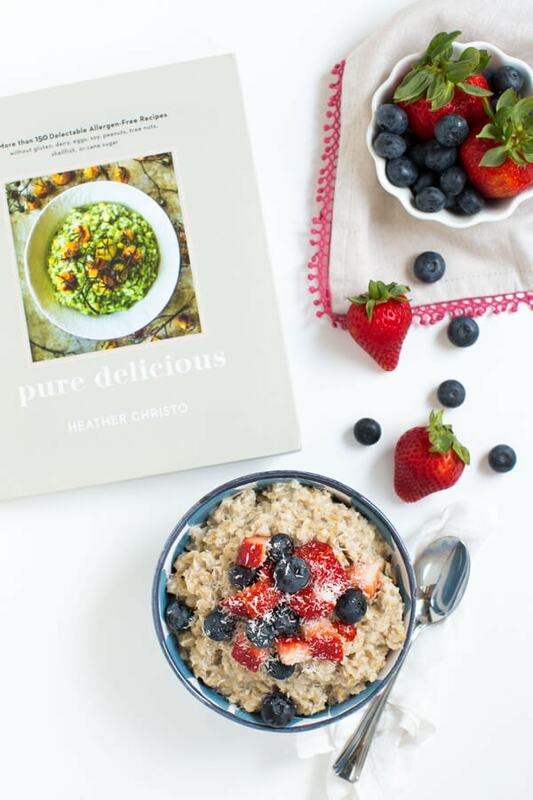 Have you seen Heather Christo’s new cookbook, Pure Delicious? It is a recent addition to my cookbook collection and I wanted to share my thoughts with you. Not only does the book detail her quest towards understanding common food allergies, it also provides over 150 delectable allergen-free recipes. Even though I am fortunate to not have many food allergies, I love Heather’s book. After all, it’s full of delicious, healthy, seasonal and nutritious recipes that your entire family will love. The book includes everything from this quick and easy creamy coconut oatmeal to grilled skirt steak with chimichurri and chocolate zucchini bundt cake. Oatmeal is on the breakfast menu in my house a few times a week. It fills me up for the day ahead and I love that I can mix in my favorite toppings or whatever I have available. I adapted this recipe slightly by adding strawberries. You can also serve the oatmeal with additional coconut milk or agave. Bananas or peanut butter are another tasty option. Go ahead, dig into a fresh and flavorful breakfast! 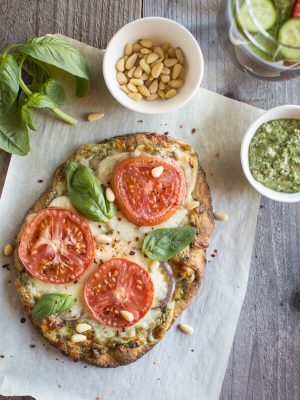 Don’t forget to try more recipes from Heather Christo’s new book, Pure Delicious. 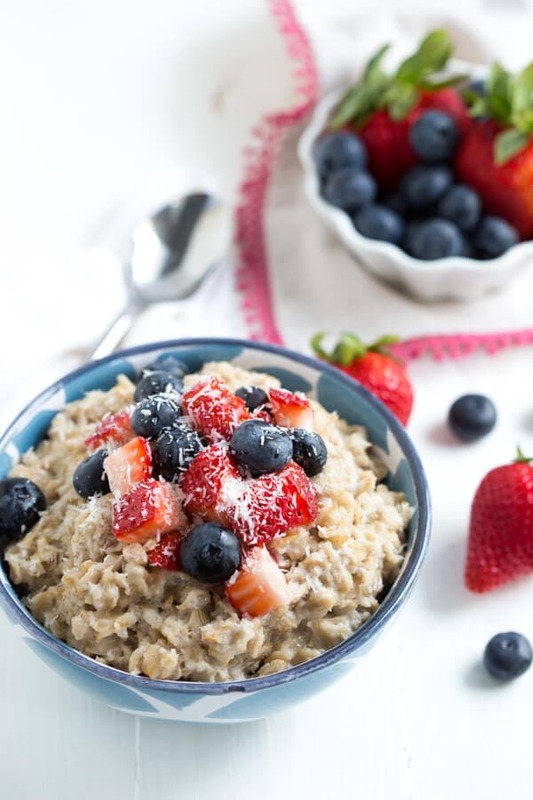 Creamy Coconut Oatmeal with fresh berries from Heather Christo's new cookbook Pure Delicious! Her new book features more than 150 Delectable Allergen-Free Recipes made without gluten, dairy, eggs, soy, peanuts, tree nuts, shellfish or cane sugar. 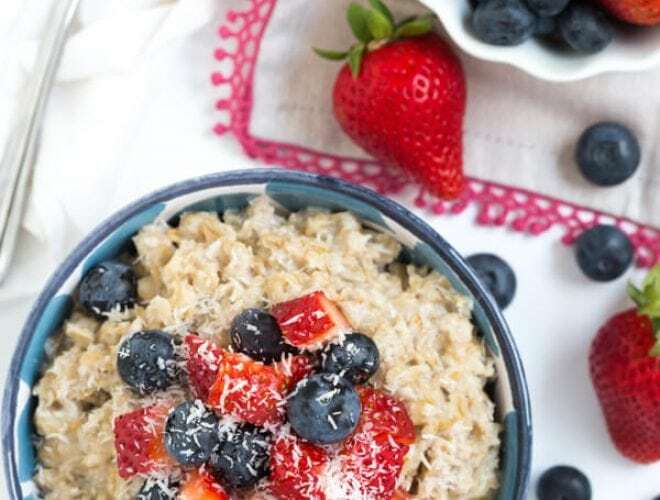 Start your day with a big bowl of oatmeal and fresh berries! In a small saucepan, bring the coconut milk to a simmer over medium heat. Add the oats, sugar, coconut, cinnamon, and salt and stir. Reduce the heat to medium-low and cook until the coconut milk has been absorbed and the oatmeal is creamy, about 15 minutes. Serve immediately, topped with fresh berries, agave, coconut milk, and toasted coconut. Is the coconut milk the type in the refrigerator section (ex: made by Silk brand) or the kind found in a van in the baking section? Hi, Amanda! Either the canned or refrigerated coconut milk will work for this recipe. Enjoy! Sounds like a fun cookbook! Looks yummy! This looks so good! Such pretty pics too. I"m a big coconut fan, so this is right up my alley. Why haven't I thought to add coconut flakes to my oatmeal. Can't wait to make this. #FamilyJoyLink. Would love for you to link up at Let's Get Real. Goes live on Thursday evening 5 EST. I love oatmeal in the mornings too! What an incredible collection of recipes that book must have -- and what a great resource in this day and age! 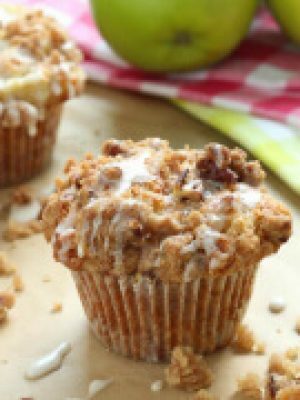 Thank you so much for sharing the book and this recipe! What pretty pictures- you made the oatmeal look gorgeous! Coconut milk adds such a delightful creaminess to oatmeal that can't be beat. This is my kind of breakfast! Love that it uses coconut milk! This might make me start eating oatmeal! I love starting my day with oatmeal. Always makes me feel so satisfied and ready to start work! Love this coconut flavor with all those berries! Coconut milk in oatmeal is genius! This oatmeal looks absolutely delicious! Just the way I like to start my mornings. I need to grab Heather's cookbook soon!